are Japanese amulets dedicated to particular Shinto deities as well as Buddhist figures. The word mamori (守り) means protection, with omamori being the polite sonkeigo form of the word mamoru, "to protect". The amulet covering is usually made of cloth and encloses papers or pieces of wood or paper with prayers written on them which are supposed to bring good luck to the bearer on particular occasions, tasks or ordeals. 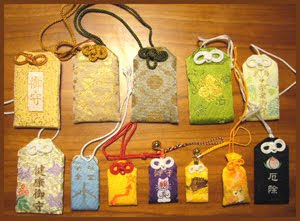 Omamori are also used to ward off bad luck and are often spotted on bags, hung on cellphone straps, in cars, etc. for safety in travel. 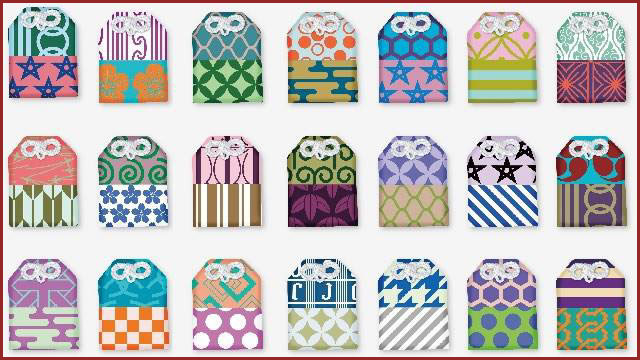 Many omamori are specific in design to the location they were made. They often describe on one side the specific area of luck or protection they are intended for and have the name of the shrine or temple they were bought at on the other. Generic omamori exist, but most of them cover a single area: health, love, or studies, to name only a few. It is said that omamori should never be opened or they lose their protective capacities. Amulets are replaced once a year to ward off bad luck from the previous year. Old amulets are usually returned to the shrine or temple so they can be disposed of properly. There are modern commercial versions for these that are typically not spiritual in nature and are not issued by a shrine or temple. They do not confer protection or need to be replaced every year. It has become popular for stores in Japan to feature generic omamori with popular characters such as Mickey Mouse, Hello Kitty, Snoopy, Kewpie, etc. Kanai Anzen: For good health and help with illness. Kōtsū Anzen: Protection for drivers and travelers of all sorts. En-musubi: Available for singles and couples to ensure love and marriage. Anzan: Protection for pregnant women during term and to ensure a safe and easy delivery. Gakugyō Jōju: for students and scholars. 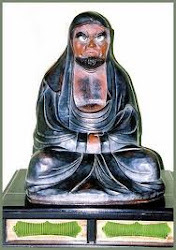 Shōbai Hanjō: Success in business and matters of money. People go to a temple or shrine and pray or make a vow for something special. They hope their prayers will be heared and richess, health etc. bestowed upon them. Vows and prayers must be sincerely petitioned and gratitude must be shown if a wish is granted. used to purify a place or person by waving over it. They come in many variations, according to the shrine and deity they are used for. A kind of ritual wand; one type of heihaku, also called heisoku. Originally gohei were identical to cloth offerings called mitegura, but the term gradually came to be used in today's more narrow sense. 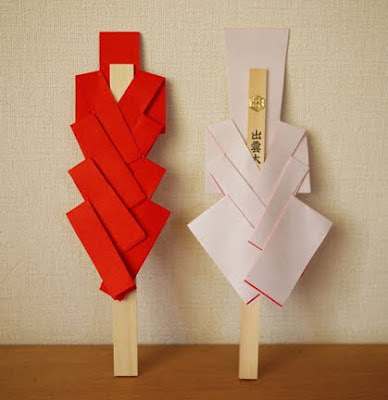 Gohei are made by attaching zig-zag strips of gold, silver, white or multicolored (five-color) paper to a staff (called a heigushi) made of bamboo or other wood. Originally, offerings of cloth were presented to the kami by attaching them to a staff, and this practice forms the origin for today's customary gohei. 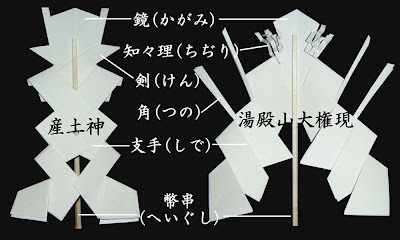 Also, while rectangular paper was used at first, the custom later developed of attaching streamers called shide to the sides. Originally an offering to the kami, gohei stood deep within the sanctuary and came to be viewed as a mishōtai, an object in which the spirit of the kami resided, or else were placed before the kami as a decoration similar to mirrors, or were used as implements with which to purify worshipers at the shrine.
. gohei no atama kazari　御幣の頭飾り headgear with gohei decoration . In Red and White, koohaku　紅白 for extra power.
. Shimenawa 注連縄 a sacred rope . The messenger of Yamanokami is the deer. The path where deer walk is also the path where Yamanokami walks. Some deer hunters say they have seen a deer with a gohei 御幣 ritual wand on its back on the path. Maybe Yamanokami has been riding this deer ? Far away in Takashiri lived a farmer named 幾蔵 Ikuzo. One night, the Tengu Deity appeared to him, placed a golden halberd and a golden Gohei wand in the ground and told him, if he made offerings of お神酒 ritual rice wine and お灯明 light, there would be no more damage of wild board in his fields. Ikuzo did as he was told and had no more damage. Other people came to him and he could cure them of their illness. He soon became a rich man. Envious villagers tried to rake away the halberd and Gohei from Ikuzo, but they had no good luck with it.